For those with a large enough living room or family in your home, it might be a good idea to have a classic L-shaped couch. A good sectional sofa will provide enough seating for you and your family when watching tv or just gathering together. That is why the Motion Sectional with Three Recliners at Costco is an ideal piece of furniture for your home. What makes this sectional unique is its three reclining seats. Yes your living room may be large enough to hold a sectional, but having a separate reclining chair my not fit or may not look right. Why buy a separate sectional and reclining chair which can each only do one thing when a reclining sectional can do both. This fabric reclining sectional can provide all the relaxation you will need and want as you sit or recline in its comfortable seats. Are there any reviews on this couch? Like how long does it hold up? the price seems so low for a sectional, just makes me wonder about the quality. I've been curious about reviews also. So far I cannot find any reviews. Hello @Anonymous, the furniture at Costco is for the most part a lot more inexpensive than most furniture stores or department stores regardless of quality. This is probably the case for the Motion Sectional with Three Recliners. 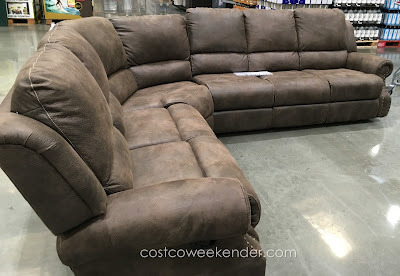 I do find the quality of furniture at Costco to be pretty good as opposed to a place like IKEA where the quality tends to be kind of cheap and rather only good enough for a college student or a bachelor pad. How can you ckean this material? In Minnesota, this sectional has a $300 rebate through Jan 22. Any comments yet on quality, durability, etc.? WE are purchasing this today and Because it is a Costco item.. They back their stuff up totally!!!!! Hi @Anniek, there's probably some kind of shampoo out on the market which you could use to clean the Motion Sectional with Three Recliners. You'd just have to do a little bit of research first though. Hello @Unknown, thanks for letting us know about the new rebate available for the Motion Sectional with Three Recliners. I'm sure people considering this sectional will find that very useful. Hi @Unknown, that's great that you'll be getting the Motion Sectional with Three Recliners. Yes, you are correct that Costco has pretty good customer service when it comes to products that you're not completely satisfied with. Bought it today at Costco. Very nice. I agree with comments - if you have any issue typically Costco will take anything back. Hi @Anonymous, that's cool that you got the Motion Sectional with Three Recliners. You'll be sure to enjoy it, and I hope it lasts you a very long time! Does anyone know what the measurements for this is? We would like to know the measurements as well if anyone can help, e.g., 96 in x 72 in. Thanks for the measurements. Costco used to carry a sectional that could be configured differently to make a "J" shaped, longer sofa. Any chance this is possible with this model? Thank you @Anonymous for posting the dimensions for the Motion Sectional with Three Recliners. No. There's really only 2 ways to configure this. The way you see it in the picture above and the opposite. This is done by moving the 3rd reclining seat to the other side. We bought the couch last week and the family's loving it. Very comfortable. Time will tell on the durability. Costco does have a great return policy though. Hello @Adam, I'm glad that you and your family are enjoying the Motion Sectional with Three Recliners. Yes, I really do hope that it'll last you and your family a very long time...hopefully, it'll go out of style before you have to replace it from wear and tear. Hello, does anyone have this Motion Sectional with Three Recliners and have pets? I have a yellow lab and a cream tabby cat, and a tiger tabby cat...wonder how that material will stand up... oh btw, both cats have claws. I did buy the Costco Cat tower and that seems to help the scratching urge. I still seem to see the cats occasionally stretch the claw on the existing cloth Costco couch. Thanks for the reply in advance.. I just bought one of these yesterday. Mine will stay boxed in the garage until a new home is repainted and contractors are finished. I'm curious about what the 41 inch wide footprint extends to when fully reclined. I'm considering using the sectional against one wall, so I'm concerned about how far out from wall the set has to sit. Does anyone have the dimensions of the 4 boxes? I am looking to pick this up this weekend, but not sure if it will fit in a suburban, or if I have to rent a truck. We just purchased it this weekend and rented a 20' U-Haul truck to get it home. $50 total cost for the rental once we returned it. So worth it! I'm certain at least one of the boxes will be too big to fit in your suburban, and there are four total. Looking forward to more seating options in our living room and being able to recline in comfort! Hello @Anonymous, I'm glad that you were able to get the Motion Sectional with Three Recliners home ok without having to pay too much on a rental truck. $50 is definitely a great price to get that sectional home. I'm sure you saved a bit from having it delivered. Hi @Michael, thanks for sharing your experience getting the Motion Sectional with Three Recliners home. I hope it'll hold up well with your pets and that it'll last you a very long time. Bought this last night - it fits in a home depot cargo truck (the closed van) that is 4' x 10'. $19 for the rental + $2 for gas (yea!). Looks great. Will see how it holds up over time. It is certainly much larger in our family room than in the Costco warehouse :-). Hello @Anonymous, thanks for letting us know the details of your getting the Motion Sectional with Three Recliners home. It sounds like you got a really good deal with the rental van. You definitely can't go wrong only paying $21 to get your sectional home. We bought this when it went on clearance at our local Costco. We have a dodge caravan that the seats drop down into the floor. It's then room equivalent of a cargo van. Taking it home in the boxes would have still been 4 trips. We took the product put of the boxes, left the boxes with Costco to dispose of and we're able to get a lot more in the van. We only ended up mading two trips. Since the pieces were all covered in good packaging it traveled safely. I love it and am anxious to learn more about this fabric and how durable it is. I'll try googling it from other sites that sell it. Either eay, I'm confident Costco has my back. Hello @BJD, thank you for sharing your experience getting the Motion Sectional with Three Recliners home from Costco. I'm sure people considering this sectional will find it helpful when purchasing at Costco. I'm sure you'll get many years of good use out of it. The price just dropped to $779.97 at the East Plano, TX location. For those interested. Hello @ChristinaK, thanks for letting us know about the drop in price for the Motion Sectional with Three Recliners at the Costco in East Plano, Texas. It looks as though Costco is slashing the price making this a really good deal. Hi Everyone we bought one of the last 3 at Matthews NC for 999. It was reduced to 799 at the Wilmington NC store but it wasn't convenient to go there. We were able to fit all pieces in our Tundra with the boxes standing up and the tailgate open! I love how it reclines flat. It is so comfortable. With the back almost touching the wall, it will recline nicely bit in order to make it flat I would need to move the back a little further from the wall. It is add so comfortable I think I could sleep in it all night. Also I stretched out on the shorter end and it is real confortable laying down. I hope it holds up, it is from China, but almost everything is coming from China. At least I know Costco will take it back if I have problems in 12 months. 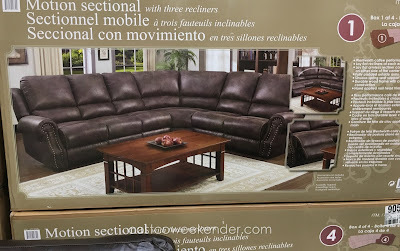 Hi @Cathy, thanks for letting us know that the Motion Sectional with Three Recliners is available in both the Costco locations in Matthews and Wilmington, North Carolina and at different prices as well. It's a good thing you had a big enough truck to take the whole set home - thanks for telling us how you transported it. It sounds like you're already enjoying your new sectional. I'm sure it'll provide you and your family lots of comfort for a very long time, but ya you're right...everything comes from China nowadays. Even high end stores have products made from China, so it's pretty much unavoidable. Just bought one for $800. Only issue is we have two of the same end pieces. We can't finish setting this up. On the phone with Costco now. Someone else had the same issue but now the store had an extra piece we needed. All good to go!! Hello @Anonymous, sounds like you got a pretty good deal on the Motion Sectional with Three Recliners even if it came with two of the same piece. I'm glad at the end of the day that it worked out for you when they had the extra piece that you needed. We received one as a gift and they had it delivered to our home. Only issue is we have two of the same end pieces. We can't finish setting this up. Is it any help to contact the customer service on the information we received or what to do? very disappointed right now. Hi @Anonymous, it doesn't hurt to either contact the Costco customer service or the manufacturer to get the missing piece for your Motion Sectional with Three Recliners. Hopefully, they can help you out. Are there anymore of these Motion sectional's available? We live in Corvallis, OR. Would it be possible for this whole unit to go through a 27" doorway? The hideabed we originally had in the room had to have it' feet removed to fit. I thought that maybe if the sectional were reclined, it could squeeze through. We also have a Reclining Lazy Boy loveseat that we were able to fit through. Hello @Unknown, unfortunately Costco has a tendency to rotate the products they have available to keep the items on the sales floor fresh and new. 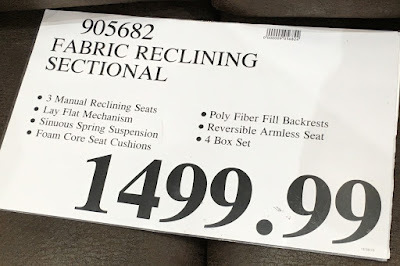 As mentioned in my post, I saw the Motion Sectional with Three Recliners at Costco a few months ago, so I'm sure that most Costco locations have already sold all their inventory for this particular sofa by now. 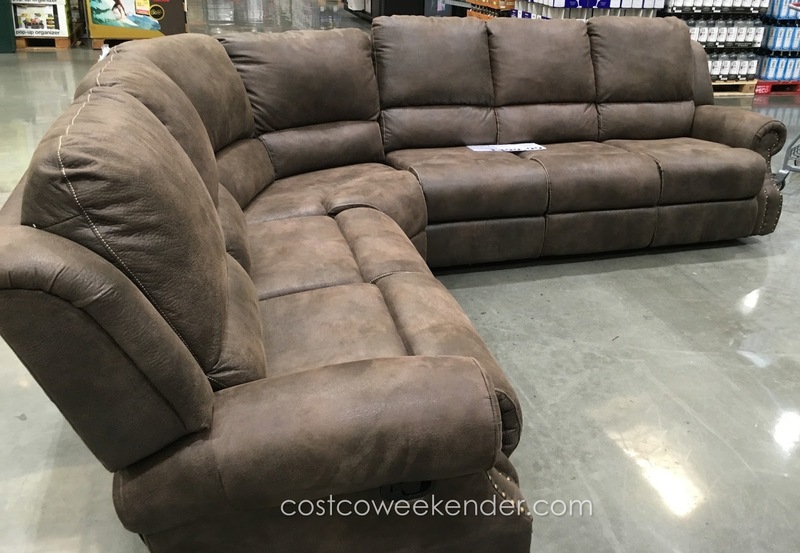 You'll most likely won't find this sectional for sale at Costco anymore, but definitely keep an eye out for something similar though since Costco always has different sectionals at any given time. Hi @Beaver, I'm not too sure if the Motion Sectional with Three Recliners can fit through a 27 inch doorway. I didn't bother measuring the different pieces of this couch, so I don't have the exact dimensions available.